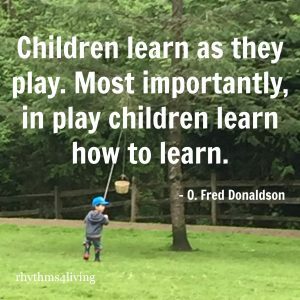 Children learn through play. Play is your kid’s job. They should have ample opportunity to play throughout the day. 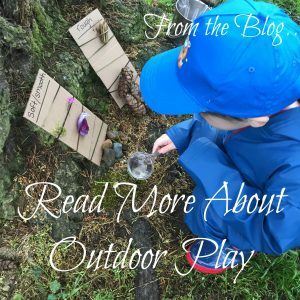 Play can be indoor or it can be outdoor. Both are important. Two things I’ve learned as a parent which has been a growing point for me: kids need to get dirty while exploring their world and they need to get outside, even if the weather is not optimal. I tend to not like messes or germs, allowing my kids to get dirty was an area of growth for me. But they need to have the opportunity to get dirty. It helps them as they are learning and it introduces them to germs that keep them healthy. As a person who prefers to stay indoors, especially when its raining, I also had to learn to force myself to get out with the kids. It was hard but it has been so beneficial to do so. Living in the Pacific Northwest I have learned that kids need to get out even on those rainy days. For my boys we invested in splash jackets, splash pants, rain jackets, hats, and rain boots. For myself I invested in a quality pair of rain boots and a rain resistant jacket. Now we are able to get out and play and explore even when its drizzling. There is something very healing and reviving about being in nature. Getting fresh air, vitamin D (even on cloudy days), seeing the greens and blues and browns, and moving around outside all improve your quality of life. So not only is this good for your kids but its good for you too. On the days that I make it a priority to get the kids outside I notice they behave better, they eat better, and they sleep better. A simple way to get started is to take a walk outside, have your kids bring a small bucket and look for small things to put in the bucket. Small pine cones, leaves, pebbles, bark, flowers, moss…anything they can find. Once you have your items you can discuss what you found – the shapes, colors, textures. Then you can categorize them by color or texture, you can put them in size smallest to largest, you can even make an art picture with them. Let the child lead in your exploration but guide them or assist them if needed.